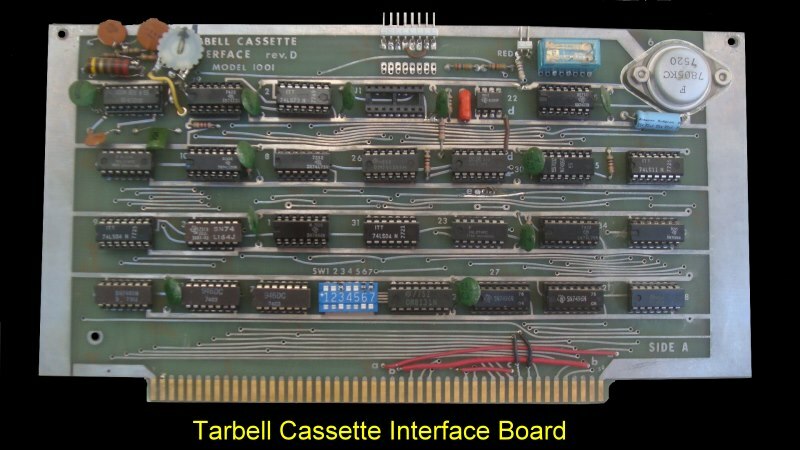 This was the board that launched the company and made Tarbell a household word in the world of the S-100 bus. The board could read and write data at up to 540 bytes /second. The "standard" Tarbell format however was 187 bytes/second. Nevertheless this was far better than the only other current non machine specific format at the time the "Byte/Lancaster" format which was only 30 bytes/second. The encoding method was a phase-encoded (exclusive-OR of clock and data), self-clocking system. The board would work with almost any decent commercial audio cassette. Though it was nicer to be able to control the tape in software with proper digital cassette recorders and reel to reel recorders. The board was flexible to any port address via an onboard dip switch. There were on the board extra status and control lines that could be utilized to control the cassette recorder (or indeed anything else). The board came well equipped with software to read and write tapes though numerous versions and improvements circulated in user groups and later in CP/M archives. One problem that helped keep his board from completely dominating the field was that in an early shipment of boards, the plated-through holes weren't properly done. In order to get the boards to work, a high percentage of the leads had to be soldered twice--once on each side of the board. If that was done the boards worked fine, and the extra time needed was not great, but during the period while the problem was being diagnosed the board's reputation got badly tarnished.